For more of the story, please read Hiking in Appenzell-Day 1 | “A slice of Heaven”. Never in my life have I made as thrilling a journey as this! I have taken cable cars up mountains where traditional Swiss farms dot the hillsides as do intimate places of worship. I began to plan my trip to Appenzellerland a year ago and it is greater than all my dreams! 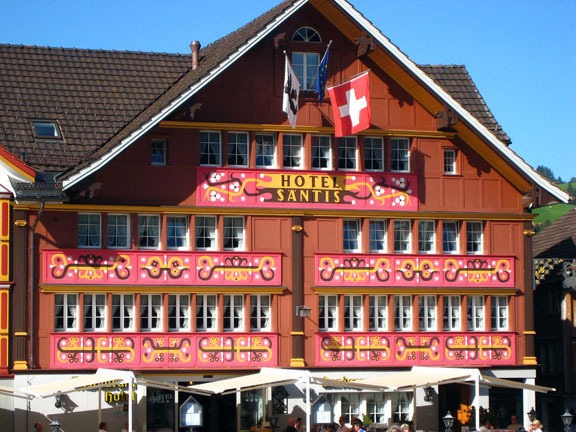 Stores in Appenzell sell the lovliest Swiss items and one can watch native craftsmen painting and doing leatherwork. I just watched a horse pull a wagon through Appenzell and two days ago, I saw an Appenzeller Mountain Dog and traditionally dressed herdsmen and boys moving cattle down a country road. I have listened to bands from all over Switzerland playing music for a competition in the town and they are mostly dressed in native attire. Tuesday, I shall enjoy the town’s annual cattle show. I feel as though my entire life has been leading to this week and shall remember every detail, forever! I have taken hundreds of photos. In Appenzellerland, perhaps more than anywhere on Earth, one finds peace and spiritual healing! Oh, my! Too, the buildings are magnificent, with detailed drawings of Swiss shields, flowers, and herding scenes! Lisa Allen, from hotel where I am staying in Appenzell.